stuck in my head. stuck, damnit. note to self…teach Emily to like different music. but on the other hand, i kinda like having her as a friend. she’s getting to the point where i can hang out with her. and take her shopping and to starbucks. we’re pals….the two of us. but i like that we can sit down and watch She’s the Man and eat popcorn and talk about the fact that there’s NO way anyone would think that Amands Bynes was a boy. she’s my daughter, but she’s also a pretty cool little girl. she’s got better style than i do, is a much better dancer (hands down) and is that friend who will always tell you the truth..the best kind of friend..
now, if only she could stop listening to umbrella….ella ella eh eh eh eh. Oh I could have wrote this … but about my son. 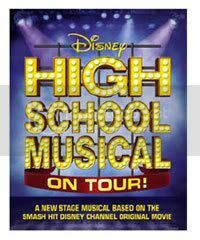 And (shoot me now) we too are going to Highschool Musical in September. At least it’s a step up from the THREE wiggles concerts I took him too! I have the exact same relationship with my 6 year old. I love it when she watches her younger brother or sister doing something silly and looks at me and just rolls her eyes. We watch the Top Model shows together and talk about how rude or sucky the girls are. And High School Musical? On tour? I am not letting that one out of the bag… it’s already sad that I know all the songs from the DVD! That’s one reason I really want a girl!! One good thing about not having kids is no Barney, High School Musical, MMC songs stuck in my head. Though you are certainly moving into one of the good things now. Oh man – I’m not even ready for my girls to be 6… never mind highschool. Though being friends with them sounds like fun. I know just what you mean. It’s nice when the 7-year-old and I get some one-on-one time together. I took her to see the ballet at the National Arts Centre last winter, thinking she’d be mesmerized. She fell asleep part way through. As we were driving home, I asked her what she thought of it, and I could see the expressions warring on her face, caught between wanting to tell the truth and not wanting to hurt my feelings. “Well”, she said, “it was exciting *and* boring.” I nearly peed my pants. I totally gave up on kid music, they’re stuck listening to whatever I have on the stereo. One priceless moment had me listening at the bathroom door while she and her 4-year-old sister performed a letter-perfect version of “Goodbye Yellow Brick Road” in the bathtub. God bless Elton John. Of course, there’s always the danger that they’ll break into a chorus of Something Corporate’s “I kissed a drunk girl” while staying at their dad’s place, cause they know all the words to that one too, but what are you gonna do, listen to the Wiggles your whole life? Because we live someplace so isolated, my oldest is still very much a little girl – but she is LOTS of fun to hang out with now. We watch old musicals and paint each other’s nails. there is definitely a cool place to be found between a crazy dictator mom and Amy Poehler mom. And friends were JUST telling me about HSM today! When you don’t have cable you don’t know of such things. My son is still stuck singing “Don’t ya wish your girlfriend was hot like me?” It’s old news now…but not to him! Ohhhh! I wanted the naked pictures!!! Emily and you are so going to be besties! 😉 She’s so mature, it’s crazy. And, you’re such a young mommy! No naked pictures today? I’m out of here! UmbrellaÃ¢â‚¬Â¦.ella ella eh eh eh eh. Seriously though, sounds like you and your daughter have a awesome relationship. That’s really cool! I think it’s great. I have the same kind of relationship with my girls. I’m always telling them that I have no idea how cool I am. We’re going to High School Musical too. I keep telling people I’m mortified, but I’m not. I can’t wait! Hahahaha! I remember that Amy Pollard character! How about the daughter though? The little one…that would dance to the stripper shows. Too funny! I know what you mean about having a little buddy. Natalie is 6 and is the same way. She LOVES Starbucks (and so does my son believe it or not..he’ll be 11 soon). I. love. the. umbrella. song. damnit. I am so going to brainwash my kids into loving it too, that way we can all sing the words TOGETHER in the CAR…cuz, yeah, thats the way I roll! oh and my housekeeper Ella was subjected to me singing/howling this at her for a good 15 minutes the other day…I am a huge DWEEB! that song is catchy… eh eh eh eh ? Viagra. Generic viagra. Buy viagra….